Coffee -- you've got some competition. Every day, more than half of the American population drinks a cup of coffee. Some like the rich flavor; others enjoy the ritual associated with pouring a morning cup. Many have made it a habit for the purpose of an energy boost. Such drinkers may scoff at the idea of sipping on a mug of tea for the sake of productivity, as typical commercial teas contain less than half the caffeine of an average cup of joe. 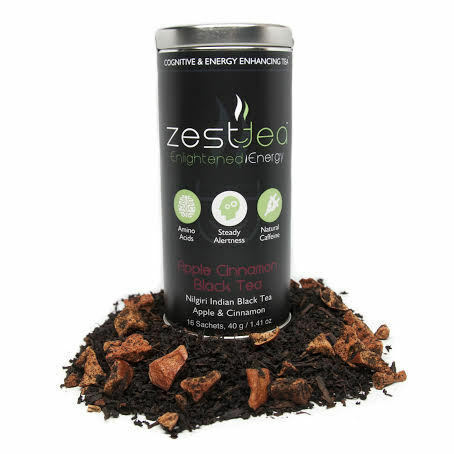 Eight ounces of coffee contains anywhere from 95 to 200 mg of caffeine, while black tea contains 14 to 70 mg -- that is, until Zest Tea, a brand that claims to be most caffeinated tea on the market. Zest Tea's black tea blends boast 155 to 160 mg of caffeine per cup, which founder James Fayal says puts the drink in line with a mid to strong coffee brew. Fayal developed the super-caffeinated brew when he realized he was compromising his taste and health preferences in order to perform at a job that required working long hours. "I would have three to four cups of tea a day, and then switch over to coffee and energy drinks to help me power through the day," he told The Huffington Post. According to Fayal, the extra caffeine doesn't change the taste of the drink. If you've ever doubled up on tea bags in an attempt to amplify tea's wake-up powers, you know that the drink gets a strong, bitter flavor. Fayal says this doesn't happen with Zest Tea because the drink's additive is "essentially an extract of the tea" that has gone through a laborious trial period. During the blending process, the caffeine substance is bound to the tea leaves themselves and included in the single pyramid-shaped bag drinkers will steep in hot water. Tea naturally contains an amino acid called L-theanine, which, at certain doses, has been shown to improve cognitive clarity and have a relaxing effect on the brain without grogginess, according to the National Institutes of Health. While more research is necessary, Fayal hypothesizes the presence of this amino acid can explain why tea drinkers don't experience the jitters and the crashes so often associated with coffee, which does not contain the compound. While coffee is America's second most popular beverage (water wins first prize), tea earns second place in the rest of the world. Fayal believes Zest Tea's caffeine component could change hot beverage habits in the U.S., where tea's popularity is already on the rise. "There's a large part of the coffee drinking market who don't enjoy drinking coffee but drink it for utility," he said. Tea with coffee's caffeine component could be a game-changer, providing both utility and taste.